My mum is very happy and settled at Fairmount. All of the staff are caring and respectful to the residents. They offer a varied timetable of activities and often book entertainers. The surroundings are clean and practical as well as being comfortable and attractive. It is priceless to be able to know that my mum is being well looked after as well as being treated with kindness and respect. 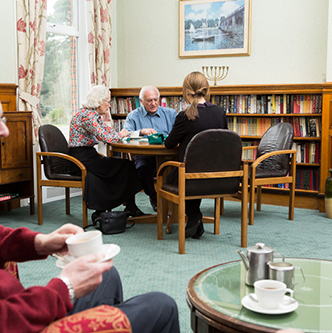 Ashglade has home cook food, comfortable rooms and entertainment laid on but what really makes the difference is the quality of staff, they are always caring, doing whatever is necessary and always finding time to talk to both residents and relatives. I would like to congratulate you all on the excellent care you gave to Elsie before she sadly died.Whenever I visited whether planned or not, Elsie was always beautifully cared for and looked comfortable. Well done. Thank you for the excellent care and thoughtfulness that you have always shown. It has meant so much to me that Kathy always seemed happy in your care and reassuring that you all knew so much about her. Just wanted to say a big thank you to everyone for looking after Rosina so lovingly over the years. She always stayed happy, bright and managed to put her sense of humour to good use. We were so pleased to see that through your efforts, our father had a very happy and settled time at Ashglade. The friendliness and understanding he received was very much appreciated by all the family. Thank you for the kind welcome we received, as a health care assistant myself I was very impressed with the care given and facilities available to the residents. Everyone was relaxed and happy in such a pleasant atmosphere. Thank you all for the kindness and care you have given to Joan. I am so glad I found Ashglade, do not think I could find anywhere else that would be so understanding and patient. A Poem written by Herbert our resident. The sun shines bright, the sky is clear, no wind or rain to interfere. Just time for my family carers to roam while I go off to a nice nursing home. An enjoyable change for us, we say, I am taking the opportunity to get away. I can only say what I will do. A friendly greeting when I arrived made me happy to be back in room 25. A rap on the door and the word "Alright", I answer, "Yes" thank you good night". I sit reading my paper full of news. Anything I want is never refused. I get several visits from friendly staff and end up having a really good laugh. My mind wanders now and again, when I thought of a structure out in the rain. I think it is called "Angel of the North" but I turned my mind the other way, to say, without a doubt to open my mouth, I can say, Thank God for my Host, "my Angel of the South"
If you are feeling poorly, need some extra care, head for Ashling Lodge , the welcome you receive, will make you believe , your soon be well again. The staff ready to give the best care to you, so do not delay go right away. Thank you for attending mum's funeral seeing you there helped us all so much and I know mum would have really appreciated it, thank you so much for all your support. I just wanted to express my gratitude for all your care, compassion and kindness you showed to my Mum and me during her time with you. I appreciate the wonderful work you do. We will always be grateful for the care and respect she was given at all times, especially at the end. I have always appreciated your kindness and help everyone at Fallowfield have given to all the family, you always took the time to chat even if you were busy. My heartfelt thanks to all the love and care you gave mum in the last 17 months of her life. You took so much care of her, making her smile and laugh again. I had not seen her like this for some years. You also made me feel like I belonged to the Fallowfield family and I always looked forward to visiting mum and you all. Thank you all for going the extra mile. I would like to thank you for the love and care you gave to my dear mum during her time she spent with you. She was with you for over two years and during that time I was able to go home knowing she was in good hands, it was not just the care which was very good it was also the love that was shown to her by the staff. I am very grateful to you all making what was a very difficult time much easier for us all. Thank you once again. Just wanted to say a massive "thank you" to you all for your wonderful care you gave my grandma over the last few years. The care delivered is of the highest standard and would not be faulted. The atmosphere in the home was caring and homely, I truly believe that it was the amazing care you gave her that meant she reached the wonderful age of 97, thank you. To all the amazing nurses and carers at Fallowfield, thank you so much for all you did for Mum.She was truly blessed to be in your care and we were blessed as a family to have such a wonderful team looking after her.Fallowfield is an excellent nursing home and you not only looked after mum but all our family. A big thank you! I am very grateful for the care, patience and understanding Maurice received during his time with you at Fairlight. I am thankful for the dignified and compassionate way he was treated during his last few days, it was a great comfort. To everyone at Fairlight, thank you so much for the love, care and dignity you showed to our mum. We were so lucky to find you to give her such good care and compassion during her last year of her life. We wish to express our deep and heartfelt gratitude for the exemplary care that all the staff gave to Betty whilst she resided at Fairlight. Although she was not keen to move there, she was made very welcome and quickly settled in. She was extremely proud of her room and loved showing visitors the view of the beautiful gardens. Special thank you to every single member of the outstanding staff at Fairlight. Thank you for all so much for looking after my sister, you cared for her so patiently and kindly. She was so happy in her lovely room, she called it home. Thank you with so much gratitude. We were so glad that my father was able to spend his last few days in Fallowfield where the care shone. The staff were all so kind and caring and we would particularly like to thank Dee and Ethna for the parts they played. When my sister and I visited prior to moving my father, we were overwhelmed by the atmosphere of Fairlight and Fallowfield and I am so relieved that Dad was able to pass away so peacefully at the end. You have both been wonderful since the day my mum came to your home.&nbsp; You will always be special to me you do a wonderful job, God bless. We'd like to thank all the carers for contributing with such kindness and loving care to Elsie's day-to-day needs. We certainly felt she was in good hands, and couldn't have received better care anywhere! Your staff are second to none and we feel privileged to have known such a wonderful team. During my mother's stay she had been shown so much love, laughter as well as care and it has never been possible to thank them enough...I can honestly say I have always been made to feel welcome on every visit and have become fond of all the staff, without exception. I can't thank the staff enough for their love and devotion to all in their care. I can't believe how blessed we were to find Mills Care. My mum is getting the care she deserves... the staff are so kind and patient. I cannot fault your standard of care, and feel your professionalism, attention to detail, and plain dedication to the residents in your care, must be acknowledged and praised. Your Heatherwood staff are second to none and we feel privileged to have known such a wonderful team. The care my mother received was exemplary and the nursing expertise of the highest standard. We had so much for which to thank the staff. They were endlessly patient and nothing was too much trouble. We also very much appreciated the way they always kept in touch with us. I know he was content and comfortable during his time at Fallowfield though he was not the most compliant of residents, I am grateful for all your patience, care and dedication to helping him get the most out of last few years with us. I was impressed by the following aspects of your care: The dignity and respect you afforded, making her feel like a guest/resident rather than a patient. The excellent job in providing her with nutritious food. The standard of cleanliness of the room. She also particularly appreciated being in a room with a large bay window facing your beautiful gardens. We would like to thank the care team for their effort, professionalism and care.